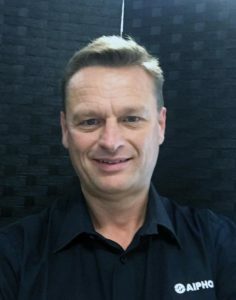 Adam Triggs, who joined Aiphone UK in 2015 as Regional Sales Manager for the South of England, has worked within the electronic security industry for over 20 years. Outside of work he puts his spare time to good use by supporting the Scout Association as a cub leader and he is also an FA Level 1 coach for his son’s football team. Any Aiphone UK customers who come into contact with Adam are likely to be impressed by his positive attitude and constant smile. We asked Adam to highlight what makes his job at Aiphone so enjoyable. “I have always been happy dealing with the pressure which comes with a sales role. Putting in the hours to ensure all the customers in my sales area are provided with the highest levels of pre and post sales service has never been a problem for me, no matter which company I have worked for. However, one of the key reasons why I am enjoying working for Aiphone UK is that I never have to worry about the reliability of our products. From our simple one to one door entry kits through to complex microprocessor-based IP commercial systems, as well as sophisticated video entry security systems for luxury apartment buildings, I know I can sell any of our products and not have concerns about receiving complaints from customers about the robustness of our solutions. The confidence we have in our products is backed by a 3 year warranty and it is worth pointing out that Aiphone is still the only intercom manufacturer to have won the Deming Prize, the highest international award for quality control. Moving our local UK headquarters during 2016 to a larger self-contained facility in White City, London enabled us to combine our office, demonstration, training and warehouse facilities under one roof. Equally important, it made a statement to potential customers that Aiphone was committed to the UK market and was prepared to make the necessary ongoing investment to match increasing demand for our products with appropiate level of pre and posts sales support. This has helped me build close working relationships with consultants, specifiers, contractors, installers and system integrators, which is another important aspect of my job which I very much enjoy.